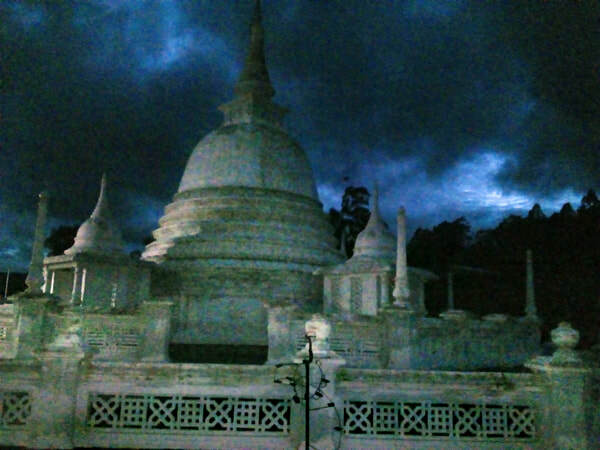 Divurumpola near Welimada in Sri Lanka's central highlands has a Buddhist temple with a stupa, which has become a major Hindu pilgrimage site in recent years, as Divurumpola is said to be the location where Sita, consort of Rama, underwent the famous fire ordeal which is known as Agni Pariksha. The Agni Pariksha is one of the best-known episodes from the Indian Ramayana epic, which is a Holy Scripture of Hindus, because Lord Rama is one of the Avatars of Lord Vishnu. Sita underwent the ordeal called Agni Pariksha, after her husband Rama had won the battle to liberate her. But when Rama finally met Sita and she bowed at his feet, her husband seemed to doubt her fidelity. He asked for a proof of her purity, as he wanted to get rid of the rumours surrounding Sita's stay in Ravana's palace. Sita was distressedd and protested her innocence. She resolved to undergo the a fire ordeal, the Agni Pariksha, in order to prove her faithfulness and connubial purity. Hence she asked Lakshmana to erect a pyre. When Sita plunged into the sacrificial fire and invoked the fire god Agni as witness of her innocence, Agni arose out of the burning pyre and lifted her from the flames and presented her unharmed to Rama, attesting to her purity. Thereupon Rama declared that he himself had never had any doubts concerning Sita’s fidelity, but that the test was necessary to prove the truth of her purity and innocence before the eyes of the people. The Sinhalese name "Divurumpola" means "marketplace of oath". This is the only reason why it has been identified as the site of the Agni Pariksha. The temple has long been respected as a suitable place for oaths that shall be helpful settling disputes between parties. 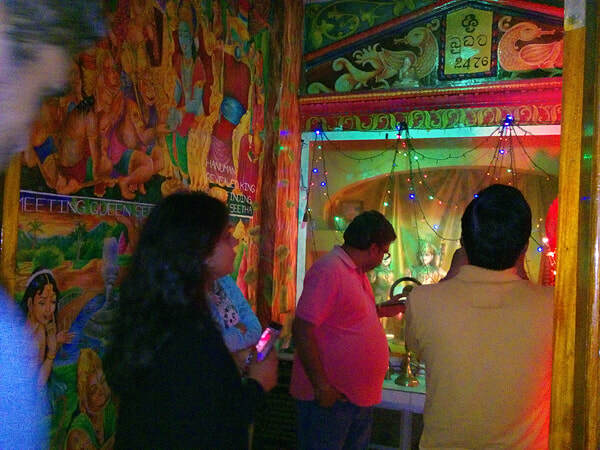 In recent years, it has been developed into a memorial of the famous Ramayana episode by adding Hindu Ramayana paintings to the Buddhist temple, which now attracts Ramayana Trail pilgrims from India. 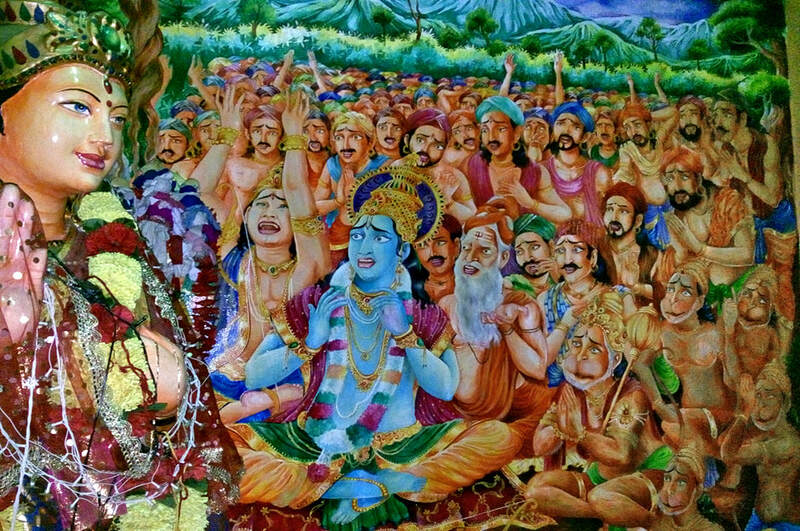 Besides te Ashoka Vatika in Sita Eliya, where Sita had spent most of her time on the island and was found by Hanuman, the place of the Agni Pariksha in Divurumpola can be regarded as the second most important Ramayana Yatra site in Sri Lanka. And now the glorious fruit is won. The hot tears streaming from her eyes. And gathering tears his eyes bedewed. And Sítá from her bower was brought. In glorious robes and gems, conveyed. With eager looks the litter eyed. Rose the wild murmur of the crowd. The Vánars, and my rights forget? I count this people as mine own. And not a king's magnificence. When marriage troops parade the street. For is not Ráma by her side? Let Sítá come her lord to meet. Who heard his words were filled with grief. As, her sweet eyelids veiled for shame. Slowly before her lord she came. She raised to his her wistful eyes. And from her breast all sorrow drove. And cleared mine honour from its stain. And with success my labour crowned. Is binding on my soul no more. The blot that on mine honour lay. All these are crowned with fruit to-day. That led mine army o'er the sea. Or Lanká filled with giant dead. Inspired me in the hour of strife. Of honour and insulted laws. That flashes on the injured sight. Go where thou wilt, but not with me. A mistress soiled with deathless stain? Scorned by my friends and all my race? And fixed on thine his evil eye. She shrank within her trembling frame. The torrent of her sorrows, rained. A hign-born dame with speech like this? I am not what thy words declare. No love and truth in womankind? The truth which all my life has shown. Fate and the robber, not thy dame. What could a helpless woman do? Thy sentence of rejection then? This lingering life, alas in vain. Their vain and weary enterprise. Named Janak's child, from fostering earth? My trembling hand in thine I laid? 'My refuge in my dark despair. Of shame, forlorn and desolate. No mercy for the weeping queen. To pray, to question or advise. And fain to die stood Janak's child. She slowly paced around her lord. Within the flame's wild fury passed. Beneath the fury of the fire. CANTO CXIX. : GLORY TO VISHNU. A glorious band of Gods was nigh. And give her body to the pyre? 'I deem myself a mortal man. 'O cast the idle thought aside. The God to whom all creatures bow. Thou Krishna of unequalled might. When sinks the earth in fire and storm. Is Lakshmí thy celestial spouse. Wouldst take the form thou wearest now. Rejoice, thou great and glorious one. Triumphant now to heaven ascend. The Lord of ne'er beginning days. Great joy shall crown his faith and love. The Lord of Fire embodied came. And gold and gems adorned the queen. Her hair was bound in glossy braid. Thy faithful queen returns to thee. Her heart from thee has ne'er declined. She still has longed for thee and wept. Her soul the giant's suit abhorred. And tears of joy his eyes bedewed. She dwelt the vassal of his power. His consort from the proof withheld. Her faithful heart was with me still. Mv queen whom virtue made so strong. As Ocean, when he raves and roars. Fears to o'erleap his bounding shores. And Sítá is again mine own. On her pure fame no shadow lies. On his dear breast she hid her face.